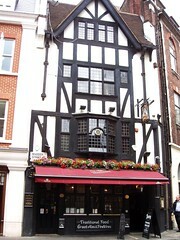 A fairly basic traditional pub in Mayfair. Since the comments below were written, it has been taken over by Greene King. In any other part of town this would be a pleasant and fairly unremarkable pub, but in Mayfair, the mock-tudor frontage and dimpled windows making it difficult to see in, rather sticks out from the other buildings. Inside, it's all carpeted, with a gas fire and two or three low tables around the edge of the room seating four, and a couple of other smaller ones in the middle. There are also some awkwardly taller square tables at the back, and by the front window. There are three handpulls for ale at the bar, with Greene King IPA, Spitfire, and London Pride (£1.50/half pint). The Pride was okay, but not particularly well-kept and rather colder than would be ideal. However, service was friendly and the pub on the whole is a pleasant place, cut off from the hustle of the outside streets. They serve food, a standard Spirit Group menu, covering all the usuals. Ewan had a perfectly reasonable soup of the day (tomato, £3.50), which was served with a decent amount of warmed baguette, and butter. Last visited by Ewan, May 2009. Opening hours taken from website, March 2012. Last edited 2013-05-10 07:33:44 (version 5; diff). List all versions. Page last edited 2013-05-10 07:33:44 (version 5).